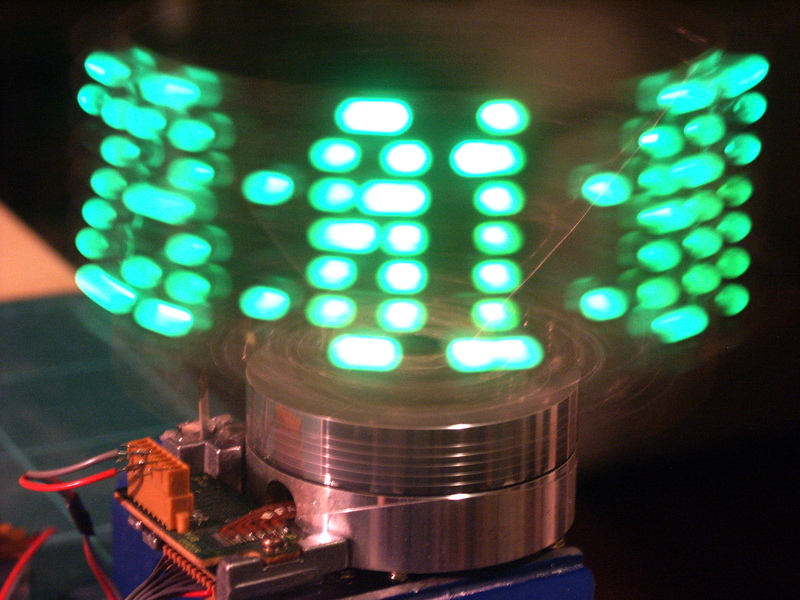 Not long ago, I decided I wanted to build a POV (Persistence of Vision) propeller clock. POV clocks work on the principle of Persistence of Vision. By turning on and off pixels very quickly across the field of vision, your eye paints all of the pixels into one image. My display rotates on top of an old VCR drum, which I consider superior to using other motors for a number of reasons. Firstly, it's easy to mount a PCB on top of the rotating drum, as they are around 6cm wide and often have a way to attach a board. Secondly, the are very quiet, due to their brushless nature. Thirdly, and most interestingly, they have a built in mechanism for powering the rotating board. Most propeller clocks make use of hacked commutators to try and get power to the board. But they tend to be noisy, a side effect of using brushes, plus the reengineering of the bearings to extract the power can result in imbalance and thus vibration and noise. So I worked out that I could use the same mechanism that's used to transfer the signal from the tape heads to the VCR guts. A rotary transformer consists of coils in the stationary part of the drum, inductively coupled to coils in the moving part. As a result, we have a transformer where the secondary is mounted on the moving drum, so getting power to the top becomes quite trivial. I am successfully able to transfer 120mA at 5 volts this way. Noiseless, except for air turbulance. 8 hi-brightness green LEDs, with PWM brightness control. RC5 remote control receiver, for control whilst spinning. IR LEDs for RC5 transmission and communication to fixed base. I designed and etched two PCBs for this clock - one is the moving board, sitting on top of the drum, and there is also a board controlling the base. Please see links on the left for more information on the clock.